Posted in: Planning. Tagged: Harley Davidson, Road King, Sturgis. So then: a change of plan. The cost of shipping Blue Rex to and from the States was working out to be too expensive and too complicated to arrange. Then a friend of mine announced he’d bought himself a Harley Davidson Street Bob. As I didn’t know which model that was, I went over to the Harley Davidson UK website to have a look and saw their link to their authorised tours. One happened to sit perfectly in terms of dates when London will be at a standstill for the Olympics and it also ticked other boxes: luxury, because I like a bit of that; and Sturgis. Now since I was a young hooligan biker, I’d always wanted to go to the Sturgis Rally so this seemed too good an option to miss out on. Deposit was paid and arrangements made for “The Ride to Sturgis” with Global Enduro. 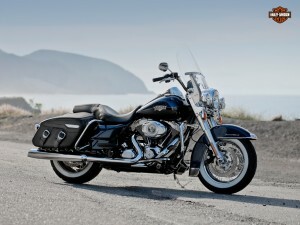 Today, I’ve had a phone call to confirm my choice of ride and I’ve gone for the Harley Davidson Road King Classic. This should hit all the right bases: a screen to stop the bugs and any rain; not too visually heavy so I can still see everything around me rather than just a load of fibreglass; some storage capacity for waterproofs and my cameras; light enough to handle reasonably; and not a ridiculous riding position or tank range.